Catholic Schools Week is always a busy one for my assembly program. This year I performed 19 shows in five days during Catholic Schools Week. 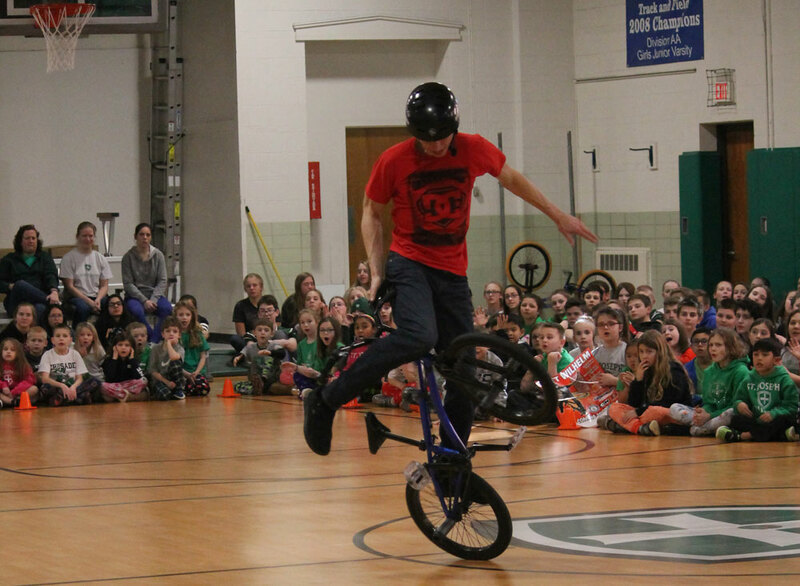 All of students (and staff) loved the tricks and message. My message of kindness, standing up for others, and resilience always fits in nicely with whatever theme the school selects for Catholic Schools Week. 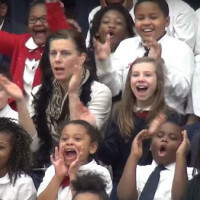 Catholic schools present a unique challenge in that you often have to entertain students from age three up to age thirteen. For example you are trying to make a kindergarten student laugh, while not losing the cool factor with 8th graders. Or you are trying to do a message geared for older students without losing the pre-K kids. 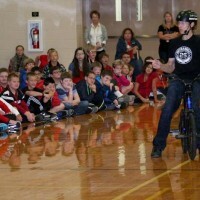 I’ve had quite a few principals tell me this was one of the few shows that ALL students were able to enjoy. 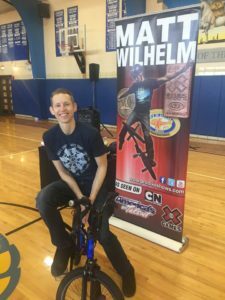 Matt's story was inspirational and a positive way to help others. 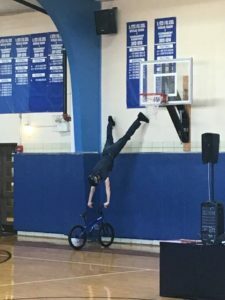 I think my favorite highlight of the week of was when Father John volunteered to be jumped over at St. Joseph School in Downers Grove. It’s not often that an adult wants to volunteer, let alone a priest. He was a great sport, which made for a great finale to the show. 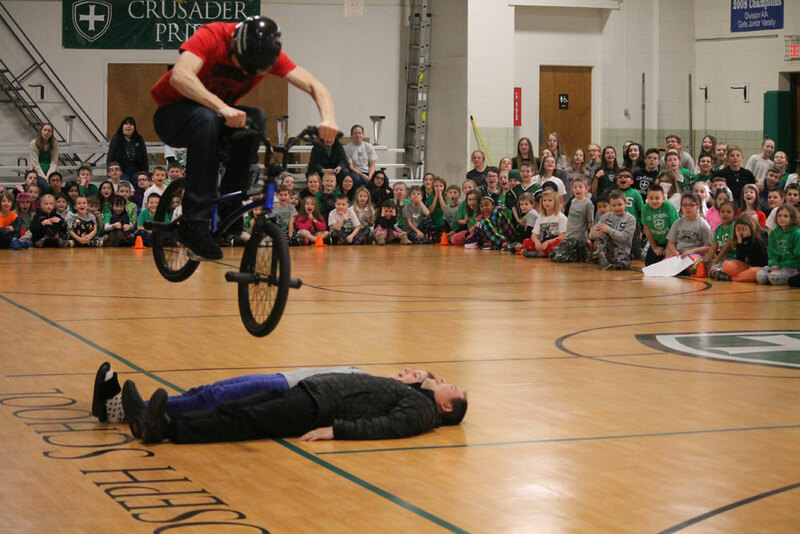 Matt jumping over Father John and a 3rd grade teacher at St. Joseph Catholic School. 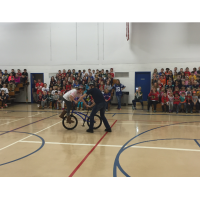 Matt performing the Spiderman at Saints Peter and Paul Catholic School in Naperville. 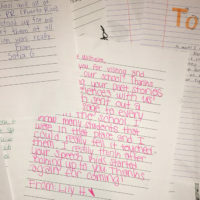 Students, regardless of age, often need something to motivate them… especially in the middle of winter. It’s easy to look up to the people on “America’s Got Talent” and simply chalk up their success to “Talent.” To the average kid sitting at home watching on TV, these people look like an overnight success. However, what students don’t get to see is the 10-years of practice that it takes to get there. My program is a sneak peak behind the scenes of what it takes to get to the last overnight. 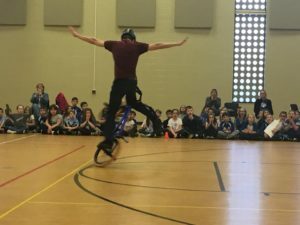 I’m always surprised by how many students are shocked to find out that I got last place during my first appearance in the X-Games. Hard work and practice are much more important than talent. My show is a great tie-in with any school that works on the growth-mindset. My school assembly program about kindness and standing up for others is perfect for Catholic Schools Week. It’s easy to forget about being kind, especially when all of our cool friends are standing around watching. 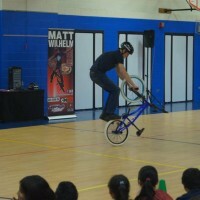 Matt performing at St. James Catholic School in Arlington Heights. One small act of kindness may have just changed my entire life.